Since we have moved from a suburb by a big city to a small town that is the big city, I find myself missing a few things. Now, don't get me wrong, there are a lot of things I love. Maybe I should list a couple of those so I don't seem all Negative Nelly. On that last point, I would like to tell you how much I have missed one restaurant in particular. I have missed PF Changs like you wouldn't believe. Okay so I have missed there and Panera. Insert cry face and boo-hooing here. I have missed three things from PF Chang's the most. 1. Mongolian Beef; 2. Cheesecake; 3. Lettuce Wraps. Since I live 3 hours plus away, I figured I should probably just accept the fact that I might need to find some homemade alternatives. 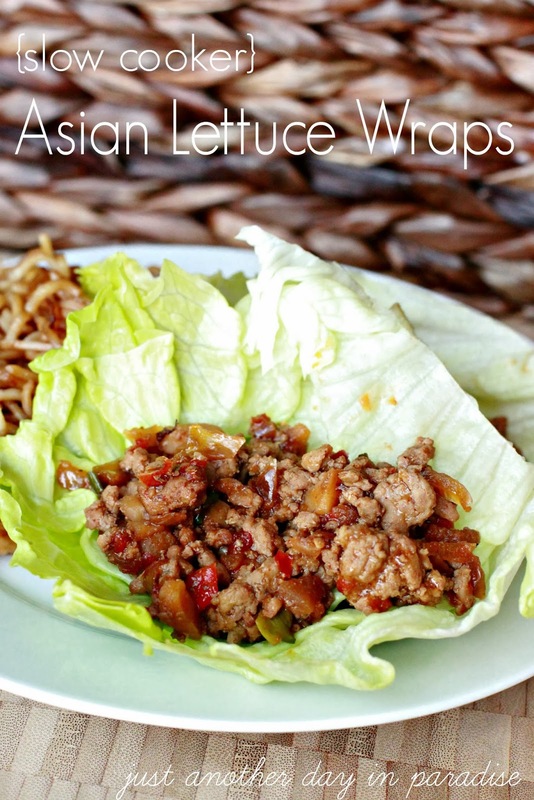 This Asian Lettuce Wrap recipe is amazing. The whole family loved it. That is huge people! Huge. One of the Little Men is more than a little picky. Even he ate this filling. Don't ask about the lettuce though. I don't want to talk about it. The fact that he would eat the filling though tells you how yummy this filling for the lettuce wraps is. People it gets better. The filling for these Asian Lettuce Wraps is made in the slow cooker. You know how I love using my slow cooker. Slow Cooker Saturday came to the rescue. This is a recipe that comes together quickly. The recipe also is a quick slow cooker recipe. Meaning it isn't an all day slow cooker recipe. So, go ahead and make yourself some. Cook the pork in a saute pan until no longer pink. Drain off fat. Put the cooked pork into the slow cooker. Stir in the bell pepper, onion, garlic, hoisin sauce, soy sauce, ginger, salt and pepper. Cover and cook on low for 2 hours. Do not be tempted to cook it on high, there is no need. Cooking it on high will just dry it out. After 2 hours, stir in the water chestnuts and green onions. Let the mixture cook for another 5-10 minutes. I will definitely try these. They look yummy! Ok yum! I wish we had a PF Changs near by too! It's too bad we didn't get to talk much the other night, but it was good to see you. Seriously, I wish we could have stayed longer and talked to everyone. I love these things too! Plus I love using my hoisin sauce. I have a few of those sauces that don't get used often enough. I love your sense of humor! Thank you for all the recipes! I just found your blog via pintrest.